As mentioned before this beautiful kusudama has Fuse has it’s author. It’s made from six 15 cm square paper and eight 7.5 cm square paper. Very easy to fold and easy to assemble; the model requires some glue/ double scotch tape to hold firmly when assembled. I translated the tassel diagram however I choose to do this variation with beads. I think it’s cute and pretty, overall. It’s also a good change from the tassels. Another reason: the thread for the tassel is orange and I wanted something with pink and red. It’s available in kits; next is a image of the kit. 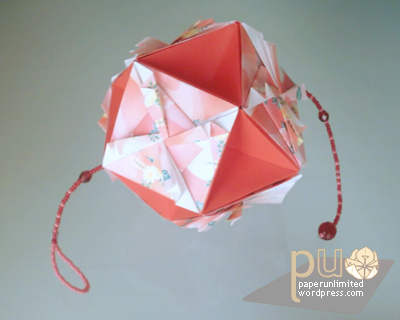 The kusudama has a diameter of almost 11 cm. Another change I made: I used double sided red paper instead of the chiyogami paper that came with the kit for the smaller units. The chiyogami paper however is already in use in another kusudama, ehehe :) Have I mentioned that I really like the final result of this kusudama? This entry was posted on 2007|03|14 at 12:30 and is filed under kusudama (glued), modular origami. You can follow any responses to this entry through the RSS 2.0 feed. You can leave a response, or trackback from your own site. It´s beautifull…How do you do that Kusudama? Have you got the modle? It’s a kit! 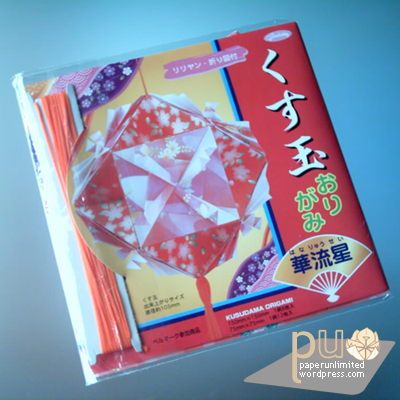 Try online stores that sell origami :) the name of the kusudama is «lilian». Hope that helps.